It’s easy enough to figure out what the weather will be like these days. You simply open an app on your phone and there it is. A decent prediction of rain, wind, and storms at your fingertips. The ability to predict the weather, and records of what the weather was actually like, have become more detailed and accessible over time. This was not always the case. Before radar, satellites, and computers, the best records we have of what the weather was like are handwritten records of what people in the past thought was notable enough to record. Even these records are limited. For storms along the Gulf Coast, first-person recordings are only reliable for the past 150 years. But knowing more about when storms happened in the past helps us understand how the climate (long term weather patterns) is changing and how to reduce storm risks for coastal communities. To do that, we have to use even more unusual records: tree rings. Clay Tucker, a Ph.D. candidate at Louisiana State University, is working to understand the climate of the past using tree rings (or visible bands of tree growth that occur each year) from maritime forests along the coast. Maritime forests, or forests growing at the seashore, are unusual. Normally forests grow further inland, in higher areas where they don’t experience as much flooding and salt stress. But this ecosystem is common along the Gulf Coast, where pines and live oak trees often grow on barrier islands and at the edge of ocean bays. Because these trees grow in areas where they experience lots of stress (like high winds, salt-water flooding, and lots of rain) when storms come in from the ocean, they tend to reflect these stressors in their growth. This is where Tucker’s research on tree rings comes into play. A maritime forest of slash pines growing next to coastal marsh at Grand Bay NERR. Photo by Clay Tucker. When he started graduate school, Tucker was interested primarily in hurricanes and climatology, but his desire to work outdoors along the coast led him to tree rings. “Tree rings are really tangible”, he said, and “we can use [them] to infer weather conditions in the past and extend our knowledge of what ecosystems were like and how things changed over time. These rings change in size as you go back in time, and that change in size tells you what the environment was like when the tree was growing.” By taking small, pencil-sized cores or sections from the trunks of trees, Tucker hoped to use tree rings to see how much trees grew each year and how weather events like tropical cyclones (hurricanes and tropical storms) affected that growth. A tree core from Tucker’s research. The core starts with the bark from the outside of the tree (dark brown) on the left. Tree rings are visible as the dark and light alternating lines. To the far right, you can see the rings begin to make a half circle. This is the center of the tree, marking the first years of growth. Photo by Clay Tucker. What Can Tree Rings Tell Us About Climate? To do this, tree rings from slash pine (Pinus ellliotti var. elliottii) were compared to known occurrence of tropical cyclones between the years of 1909 and 2014. 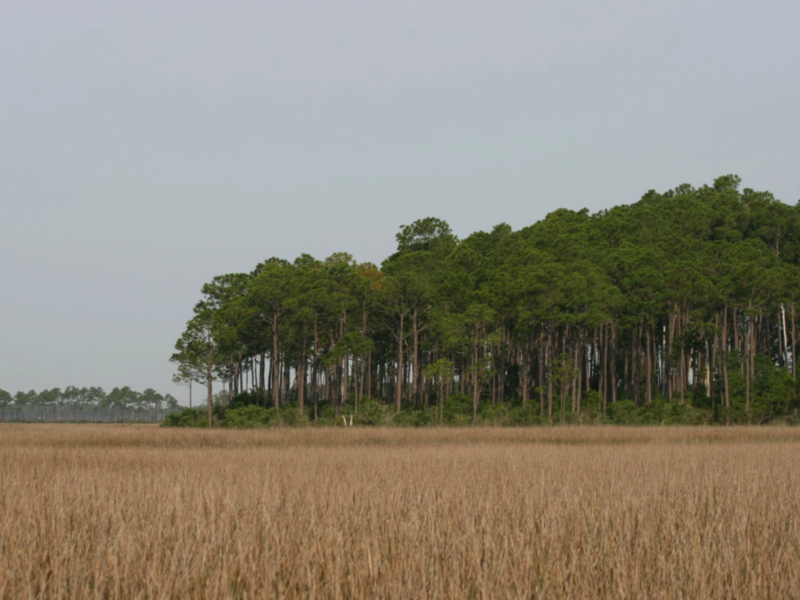 For slash pine trees at the Grand Bay National Estuarine Research Reserve, tree growth decreased the year following a tropical cyclone. Some trees grew less for up to six years following a tropical cyclone event. This decrease in growth was linked to storm surge and flooding with saltier water during storms. During tropical cyclones, tree crowns (the leafy top of trees) are often lost. To regrow the tree crown (including parts like leaves that are important for photosynthesis) and flush saltwater from its system, trees put less energy into trunk growth. This led to smaller tree rings in years following tropical cyclones. Few studies have used tree rings to show when tropical cyclones happened in the past, but Tucker’s study demonstrated this is possible by proving tree growth changes following tropical cyclones. Tucker coring a tree. Cores are taken using tiny augers that minimize damage to the tree. Photo by Clay Tucker. Why Should We Care About Past Climates or Ecosystems? While a 150-year written record of past tropical cyclones may seem like enough information, Tucker disagrees. “The big takeaway here is that by increasing our knowledge of the past, we increase our confidence in future predictions.” Or, by understanding more about climate in the past, scientists can better understand how climate will change in the future. Next, Tucker hopes to use tree rings to understand ecosystem health in the past. “This study increased knowledge about hurricanes of the past, but we have decent records because they’re extreme events. What we don’t have is a lot of knowledge about ecosystem health.” By studying tree rings in maritime forests, Tucker will be able to better understand the effect of past climate on tree growth and health along the Gulf Coast. Clay S. Tucker, Jill C. Trepanier, Grant L. Harley, and Kristine L. DeLong (2018) Recording Tropical Cyclone Activity from 1909 to 2014 along the Northern Gulf of Mexico using Maritime Slash Pine Trees (Pinus elliottii var. elliottii Engelm.). Journal of Coastal Research: Volume 34, Issue 2: pp. 328 – 340. A maritime forest growing at the edge of marsh in Grand Bay National Estuarine Research Reserve. Photo by Clay Tucker. Ashley has a background in veterinary medicine and completed a Master’s degree at Nicholls State University on endocrine disruption in blue crabs in 2016. Her research interests include wetland loss and management, ethnobotany, and science communication. Her PhD research at Louisiana State University is on coastal wetland ecology. Specifically, she is studying the processes that drive marsh surface elevation and how these processes are influenced by plant communities and management techniques. Through this work she hopes to inform marsh management plans to increase marsh elevation while providing valuable habitat for important waterfowl species.